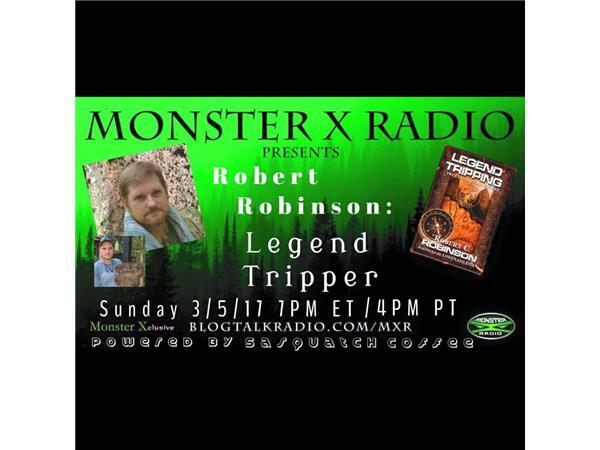 Join Monster X Radio hosts Gunnar Monson and Shane Corson as they sit down with 'Legend tripper' Robert Robinson. Robert Robinson grew up an Army brat. After graduating high school at Lansing Kansas, Robert enlisted in the United States Army..During his 21 years of service, Rob served in numerous locations including OPeration Enduring Freedom in Afghanistan. He retired from the Army in 2003. Rob, when he was young, became interested in Cryptozoology after watching the TV series “In Search of” and the movies” The Abominable Snowman of the Himalayas” and “The Legend of Boggy Creek”. His mother, who is from Scotland, related stories of the Loch Ness Monster, to him. Also, his uncle would relate scary stories of the Fouke Monster and Bigfoot. Because the whole subject of real monsters scared him, Rob started researching monster legends by reading every book he could. His fear turned into intrigue and then became a hobby and passion. Rob started going on Swamp Ape expedition with the Bigfoot Field Research Organization. Tracy (Rob’s wife) also had an interest in the unexplained and accompanied him on his monster hunts. Tracy also conducted paranormal research investigations such as haunting and ghosts. Rob has accompanied Tracy on numerous ghost hunts. Robert took the Cryptozoology college class with Florida Keys Community College. Rob is also a member of MUFON to further explore his interest in UFO’s and extraterrestrials. Rob likes to refer to himself as a Legend Tripper, and goes on at least one Monster/Ghost hunt a month when his schedule allows. During a recent trip to Pennsylvania Rob and his wife stayed in a haunted bed and breakfast and conducted a ghost hunt. Rob has stated that “When you are out at night, monster or ghost hunting, there is nothing better than being scared and excited at the same time.